This debut novel by Carrie Harris is fun—if, like me, you enjoy the occasional zombie book! High school junior Kate Grable is the football team’s student trainer. She is hoping that the experience will help her get into a good medical school, but up until now she’s pretty much just been in charge of the Gatorade cart. One afternoon she notices a bunch of unlabeled bottles in the coach’s cabinet. She suspects they are steroids until one of the players collapses at a party. Kate swears the boy is dead, until he lurches to his feet and walks away. He can’t be dead if he walked away, right? After a few more players show the same grayish skin and dead-like symptoms (like trying to munch on other students), Kate is ready to think the unthinkable. Something has turned these players into zombies. Before the whole town comes down with the zombie infection, Kate has to find a cure. And if she manages to get a date to the homecoming dance in the meantime—so much the better! The books are fast-paced and easy to get into. It isn’t particularly scary reading about zombies running loose in school. And while there is a certain “ew, gross” factor, even that is handled with humor. Add that to the usual high school angst, and friendships, and crushes…. it makes a great introduction to a series of books about geeky Kate and her high school adventures. I wonder what will happen next to this aspiring medical student! Check the WRL catalog for Bad Taste in Boys. Are you searching for a beach read? Look no further… I have just the book for you! Michael Capuzzo’s Close to Shore: A True Story of Terror in an Age of Innocence will keep you on the edge of your seat (and perhaps out of the water!) This page-turning drama chronicles a series of fatal shark attacks that occurred off the coast of New Jersey during the summer of 1916. The current ichthyologic knowledge of the time, newspaper accounts, interviews, medical journals and other historical documents, interwoven throughout the book, put the reader in the moment of this terrifying summer. The momentum builds as subsequent victims are taken during the course of twelve long days. How the victims, their families, the community at large, as well as the community leaders cope with the tragedies and the unexplained source of the terror and work together to attempt to put a stop to the seemingly uncontrollable water beast provide an interesting and heart pulsing read. Don’t miss Close to Shore… and I imagine after reading it, you may remain “close to shore”! Check the WRL catalog for Close to Shore. John Henry Patterson was the engineer in charge of construction, so, by default, it became his responsibility to put an end to the depredations. The book relates his efforts to do just that and despite his understated prose, it’s a nail-biting read. These lions were smart, fearless and vicious. It’s not known exactly how many people they devoured, but Patterson affirmed 28 railway workers and they are traditionally credited with 130 kills before finally being stopped. First published in 1907, this non-fiction thriller is rightly considered a classic of Africana and hunting literature and is recommended for people who like true tales of adventure and don’t mind a little gore… OK, maybe more than just a little gore. Check the WRL catalog for The Man-eaters of Tsavo. Some book titles exaggerate to attract readers, and the subtitle of this book, “Saving The World’s Strangest Parrot,” sounds like hyperbole, but in the case of the kakapo, it is simple fact. The New Zealand Kakapo is the world’s only nocturnal parrot. It is also the heaviest parrot, often weighing eight pounds. Of course, a bird that heavy can’t fly, so it climbs trees using its claws and beak, only to spread its wings and drop to the leafy forest floor like a stone when it is time to get down. To attracts mates in the dense New Zealand forest the male kakapo digs himself a bowl and booms like a drum. And if that isn’t enough, they smell so strongly from a fungus that grows in their feathers that humans can easily pick up their musty, honey-like scent. Sounds like the world’s strangest parrot? It does to me! Not only is the kakapo strange, but the combination of flightlessness and friendliness mean that it is extremely vulnerable to predation by carnivorous mammals that have been introduced to New Zealand, such as dogs, cats, weasels and stoats. Unwilling to allow the extinction of the bird that once thrived in millions all over New Zealand, the New Zealand government and private charities are scrambling to save it. Kakapo Rescue describes a thrilling story with the bird going from a population of millions in the 1800s to presumed extinction in the 1950s. Over sixty expeditions searched for kakapos in the 1970s, and they found eighteen birds, which was great news for a bird assumed to be extinct, but they all turned out to be male. Finally in 1977 scientists found a surviving population of two hundred on Stewart Island, to the far south of New Zealand. But kakapos breed slowly and they were still struggling, until by 1995 there were only fifty-one kakapos left. The New Zealand Department of Conservation has set up a remarkable breeding program on tiny Codfish Island, off the coast of Stewart Island. Up to fourteen people live in a hut year-round solely to help the birds. The happy news is that according to the Kakapo Recovery website there are now nearly 150 kakapo, although the number goes up and down a little as some kakapo die while some eggs hatch. In our library, both copies of Kakapo Rescue are shelved in the children’s department. This book is definitely interesting and detailed enough to capture the attention of bird- and nature-loving adults, while being accessible to older children. Every page has dazzling photographs by renowned wildlife photographer Nic Bishop. I strongly recommend Kakapo Rescue: Saving the World’s Strangest Parrot for people enraptured by dramatic conservation stories and those fascinated by bizarre birds, such as penguins. It will also grab travel buffs who want to learn about the soggy and windswept beauty of southern New Zealand. Check the WRL catalog for Kakapo Rescue: Saving the World’s Strangest Parrot. 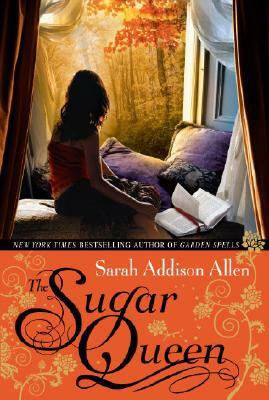 I enjoyed Sarah Addison Allen’s first book, Garden Spells, so I picked up her second title, The Sugar Queen, to see if it continued to delight with quirky characters and interesting plot lines. It does! Josey Cirrini is trapped by guilt and fear in the house she has grown up in – torn between her sense of obligation to her cold, demanding mother and fear of change. She finds comfort in her secret stash of sweets and travel magazines hidden in her closet. One morning Josie wakes up to discover a woman, Della Lee, hiding in that closet. Josey wants Della Lee to leave – but Della threatens to tell Josey’s mother about her sweets (it’s an embarrassing mountain of bad-for-you food). Her fear of being a bigger disappointment to her mom and the hint of desperation in Della Lee’s voice, convince Josey to let Della Lee stay until she can get herself together. What really happens is Della Lee helps Josey get herself together. With the encouragement of this odd adviser, Josey makes a good friend, finds true love and gains the courage to leave the past behind her. Allen weaves interesting magical elements through out the story – in addition to Della Lee living in Josey’s closet, there’s a man who is able to steal women’s souls, a family that must keep any promise made, and (my favorite) a woman to whom books appear out of nowhere. If you can suspend your disbelief, you’re in for a real treat. Short story collections generally don’t circulate well. I’m not sure exactly why, but I can certainly theorize. Personally, I enjoy immersing myself in a detailed, involved story, with well-thought out characters and vivid settings, but the very nature of short stories (They’re short!) seems counterintuitive to achieving those lofty goals. Honestly, If I’d known Unaccustomed Earth was a collection of short stories, I don’t think I would have bothered to pick it up. Fortunately for me (and I hope, by extension, you), the cover of this advance reader’s copy wasn’t very clear about the nature of this book, so I took it home and was several pages in, before I realized I was “duped.” Having frightened you away, let me lure you back in by saying that I really loved this collection of short stories, and Lahiri gave me almost everything I was looking for in a work of fiction. Lahiri is the daughter of Indian immigrants, and her cultural background and life experiences figure prominently in her stories. The main character is usually an educated woman, almost always a second-generation Indian, and often involved with a non-Indian love interest. The consistency of her characters has led several reviewers to characterize Lahiri’s work as repetitive, but I think most of her stories transcend their characters’ origins. I, for instance, am an educated woman of mostly German ancestry (many generations removed), and while my love interest is non-Indian, that’s hardly remarkable since I am not Indian myself. Yet even so, there was much in Lahiri’s writing to which I could relate. (I found myself thinking about one story for days, even weeks after I read it. I don’t even feel comfortable sharing it here, because it hit way too close to my personal life.) While the Indian culture provides an interesting backdrop for the stories and occasionally produces conflict, in the end, I think what Lahiri is really writing about the complexities of life itself. What could be more universal? Lahiri’s writing style is simple, but elegant, and is well-suited to the short story format. (I did not find her novel, The Namesake, quite as engrossing as her short story collections.) Sometimes the stories end on a sadder note, sometimes, a happier, and occasionally the reader is left uncertain how to feel. In fact, to say that her stories ever really end is perhaps misleading. Each conclusion features a transitional point in the main character’s life, a turning point with considerable implications. While the writing ends, the reader can’t help but be aware that the characters’ lives continue to go forward, and I have to say, if there was one frustration I had, it was that I wanted to follow them further. Ultimately I still found the stories satisfying, because I was encouraged to think long and hard about what had happened and what it might mean. Even so, those readers who appreciate tight, neat endings, with all the loose ends wrapped up in a neat little bow, might be frustrated by Lahiri’s technique. Otherwise, I would say Unaccustomed Earth is an excellent choice for both fans of multicultural fiction and those who simply enjoy good stories about the ups and downs associated with being alive.